Oh, yeah… this thing exists! So today, (May 5) the SSA released the most popular names of 2010. Without further adieu, I present the top ten (if, for some reason you haven’t seen it already). So, I predicted Jacob’s stickiness. It’s been there for more than a decade. I wasn’t surprised by Aiden’s appearance, although I think it’s rather amusing that both Aiden and Jayden are in the top 10. William still hasn’t moved down. (GRR). I didn’t think Isabella was going to stay the top name. I mean really. The Twilight rage is pretty much over. I thought either Sophia or Olivia would be the number 1. Sophia bumped Emma out of her #2 spot. I was pretty surprised that Olivia fell. I’m rather glad to see Madison going down, it’s starting to get dated. The girl’s names are literally all the same. As for the boys, newcomer Aiden knocks off Joshua. I’m surprised Joshua fell so quickly. More on the fall of Hannah later! It’s been lurking in my drafts box for a while, but here it is, finally, Gwen, Will and Cec. Yeah, I know I said they’d be in pairs, but it’s pairs of girls and a boy, okay? Gwendolyn: Originally, this coveted second (third?) spot was held by Katherine. Nothing had the hope of reaching the heights of Elizabeth (until Elisabeth and Rose came along). Then I started realizing my REAL naming style, and just how many names are really out there (especially for girls!, but more on that later.) So Gwendolyn and her minions started to creep up my list. Her minions being Genevieve and Gwenhwyfar (well, that’s Welsh for Guinevere.) So Gwendolyn sat at a comfortable number 5, and started creeping again, bringing with her Charlotte. Charlotte and Gwendolyn were BOTH my number two for a while, but Charlotte started to lose favour, and while it’s still on my top 10, it isn’t quite as high anymore. Cecily: This one’s a member of my C group (that includes the aforementioned Charlotte, as well as Caoimhe, Cole, Christian, and Clara). It’s my favourite form of Cecelia, and I don’t even remember how I stumbled upon it, but I loved it almost immediately. (And, BTW, it’s SESSA-lee). Interestingly enough, I dislike Cicely (I don’t like the SISS sound, but I love SESS). I like the nickname Cec (SESS), but do you think it’s too close to Cess (as in cesspool)? I think I could see myself with a pair of daughters named Rose and Cecily or Elisabeth and Gwendolyn, but not Gwendolyn and Cecily, for some reason. (Liss and Cec are fine, though). Next in this little series is Charlotte, Isabel, and Jonathan. I’m a creepy internet stalker, I know. What I hate about myself? Not much. I don’t think I really HATE anything. I don’t like that sometimes I say really, really stupid stuff. I can’t stand stupid people. I’m judgemental, and I don’t like people who name their kids things like Lenga Tnes Nevaeh (Heaven Sent Angel). Oh, and I procrastinate. It took me 2 hours to write this. Well, the name of this blog IS Love and Names, so it’s not just about names. Now I need to rant about Kellyn, Little Miss, EGLM, and purple. D: Purple: As per the bet with myself, I can’t wear purple until Wednesday next (2/2/11). I wear a LOT of purple, so this is hard. Damn laundry. I have several usernames around the internet. The oldest one has been with me since I entered the internet when I was 11 (2005). My email account is slightly older than that (something like 2003). All my emails have the same name, Applemittens (and those are my main emails, Hotmail, Yahoo, etc.). I have other emails (like the one for this website is loveandnames@hotmail.com) I have a business email, and a professional one, LauraRoseS******. But Applemittens is my very first. It comes from my childhood love of horses (specifically Appaloosas, hence the Apple) and my cat Mittens (who died in 2005). My first individual accounts, starting when I was 13 were on Nick.com and Neopets. I was trying to come up with something unique, and my aunt was over with her dogs, so she suggested Misty, one of them. So MistyDoggie it became. Later, that morphed into a new account, MistyPony, with the double meaning of the dog and the horse (because I was still obsessed with horses). And I made a new one so I tacked on 1994, the year I was born. I get called MistyPony or MP94 a lot. 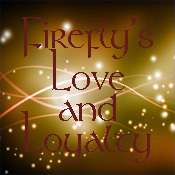 And my most recent acquisition, Firefly’s Love and Loyalty (born Summer/Fall 2009). I love the Vampire Academy books, and the tagline is “Love and Loyalty Run Deeper Than Blood”… the Love and Loyalty bit. I was entranced by the fireflies outside my window for weeks, and I really wanted to use it as a name somewhere, so when I made a new account, with a username that was allowed spaces, I didn’t want to use MP94, because it seemed overused, and I was trying to be more creative, so Firefly’s Love and Loyalty it became. I now use MP94 and Firefly interchangeably, tending towards MP94 because I’ve used it for so long. When I do use Firefly, sometimes the whole thing is too long, no spaces are allowed, apostrophes don’t show up, etc. Then I just become FireflysLove. P.S. On my use of Laura Rose as my internet name. Being a BN lover, I frequently run into other Lauras, so I became Laura Rose to distinguish myself. I’m just Laura in RL. Yeah, I know I said it’d be William and Co., but I felt like doing this. My middle name is Rose. It’s my favourite name, and favourite middle name. Wait… what’s up with all those -bel(le) names? Well, I don’t know, I love them so much. Interestingly, I don’t neccesarily love -elle names for middle names, though. I’m not in love with many boy’s names, but the ones I do like tend to work as both middle and first names.